Universal City, California, July 31, 2014- A disenchanted master chef reclaims his love for cooking and his family during a rollicking road trip through some of America's most mouthwatering food destinations in Chef , coming to Blu-rayTM Combo Pack, DVD, and Digital HD with UltravioletTM on September 30, 2014, from Universal Studios Home Entertainment. Writer, director, actor Jon Favreau (director Iron Man, Elf) stars in this heartwarming comedy with something on the menu for everyone. The Chef Blu-rayTM Combo Pack include uproarious deleted scenes, as well as feature commentary from Favreau and the film's technical advisor and co-producer, food-truck pioneer Roy Choi. 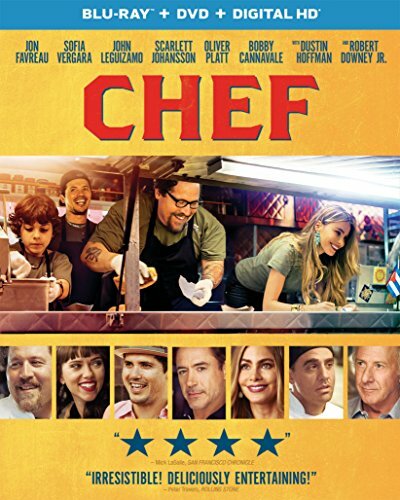 An online feud with an influential food critic (Oliver Platt) and a creative disagreement with his investor (Dustin Hoffman) convince Carl Casper (Jon Favreau) to hang up his apron at a posh Los Angeles bistro and get his mojo back in Miami's Cuban-inspired cuisine. When his ex-wife (Sofia Vergara) helps him get a fresh start with a rundown food truck, Carl and his best friend and sous chef Martin (John Leguizamo) head across the country with Carl's young son Percy on a culinary adventure that helps Carl rediscover what matters in life. Robert Downey Jr. (Ironman, Sherlock Holmes), Scarlett Johansson (Her, The Avengers), John Leguizamo (Ice Age, Ride Along), Sofia Vergara ("Modern Family," Machete Kills), Bobby Cannavale (Blue Jasmine, Win), Oliver Platt ("Fargo," X-Men: First Class), Amy Sedaris (Strangers with Candy, "Alpha House)" and two- time Oscar-winner Dustin Hoffman (Meet the Fockers, Rain Man, Kramer vs. Kramer) star in a film that Pete Hammond of Movieline praised as: "Highly entertaining!...It's got it all: laughs, warmth, terrific actors and lots of mouthwatering food. Jon Favreau has cooked up a real winner NOT to be missed!" * DIGITAL HD with UltraViolet(TM) lets fans watch movies anywhere on their favorite devices. Users can instantly stream or download. Universal Studios Home Entertainment is a unit of Universal Pictures, a division of Universal Studios (www.universalstudios.com). Universal Studios is a part of NBCUniversal, one of the world's leading media and entertainment companies in the development, production, and marketing of entertainment, news, and information to a global audience. NBCUniversal owns and operates a valuable portfolio of news and entertainment television networks, a premier motion picture company, significant television production operations, a leading television stations group, world-renowned theme parks, and a suite of leading Internet-based businesses. NBCUniversal is a subsidiary of Comcast Corporation.